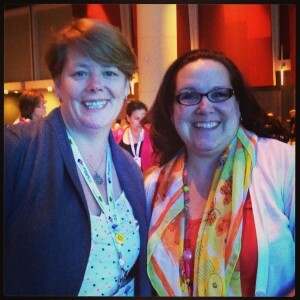 Networking at BlogHer '13 Really Means Lots of Friendly Faces! 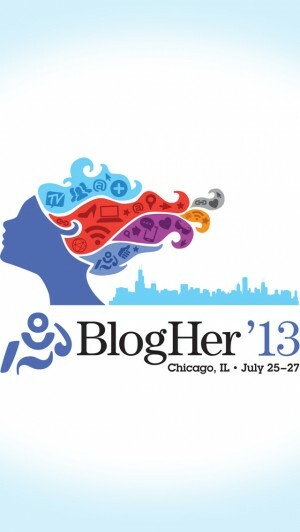 Last Thursday, like thousands of other women from all around the country, I headed to BlogHer ’13 — the leading conference for women bloggers looking to network with their peers and chart a course of growth and development for themselves. To say it was a great experience is an understatement. I went for work, but was also able to find personal value along the way. And while I wasn’t really sure what I was in for when I went, but as the event unfolded, I found out what keeps people coming back year after year. 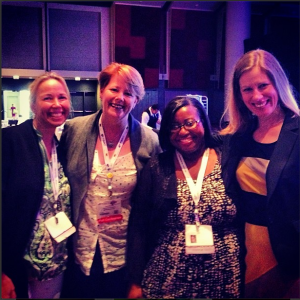 Today I am featuring photos of some of the great people I got to visit with while at BlogHer ’13. I will post again about the kinds of speakers and programs I took in. 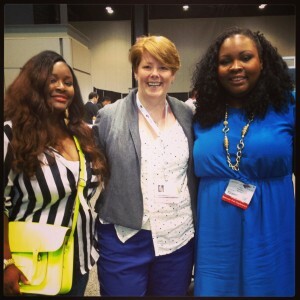 Here are some of the things that stand out the most for me as I reflect on my first BlogHer conference experience (you may remember some of my coworkers & I were featured on the BlogHer site this spring). One of the pieces of networking, is you get to a conference for the first time and you already have familiar faces to pass in breaks, maybe grab a seat with and visit for a while. Well, for me, that started in the St. Louis Airport as I ran into local crafting blogger of thatswhatChesaid.com — Che is Cheryl… I love that name! We visited on our short flight and I hope she’s going to help me come up with a great idea on how to visually showcase some of my travels! 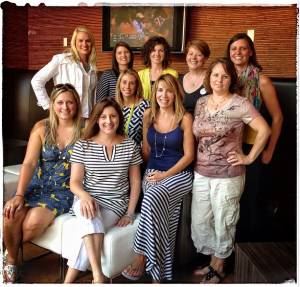 I could say my first BlogHer conference experience was years ago as the board of the AgChat Foundation sought a farmer blogger who would attend BlogHer in San Diego. Anyway, I remember talking about that years ago and Nancy Grossi aka Wife of a Dairyman agreeing to go to the conference. Last year, several other farm women joined her and this year there were even more! Meeting up with these blogging friends who all love agriculture was a way for all of us to get together before the event started. Starting in the back left of the following photo, you can see Katie Pinke of The Pinke Post, Stacy Shutz of Schutz Farms, Emily Webel who writes Confessions of a Farm Wife, me, Emily Zweber of Zweber Farms, coming from the right front is Jenny Schweigert of The Magic Farmhouse, Nancy, Jamie Vander Molen who works at DMI, Aimee Whetstine of Everyday Epistle and Leah Beyer of Beyer Beware. There are people I have talked to “on the Twitter” or Google Plus for years that I FINALLY got to meet. Its funny, because I wasn’t even sure who all would be there, but there I sat on Friday hearing one of the speakers talking and then I realized Peg Fitzpatrick was in the room. 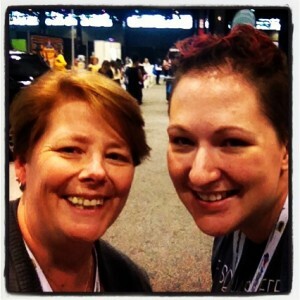 After years of blog chatting with her, I felt certain we had to meet! And I also had a chance to put the the name Jodi Okun with a voice and face too! 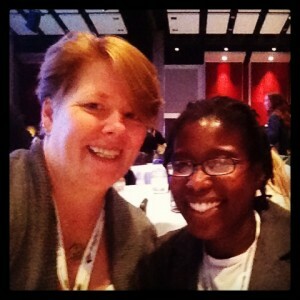 Jodi runs College Financial Aid Advisors and we met through Twitter’s #dadchat. So fun meeting people after so long! I caught up with fellow St. Louis blogger Slap Dash Mom (aka Sadie) who I see online frequently but hadn’t seen her for months…. I think it was a STL Bloggers meet up where we last caught up. One of the folks I met at last year’s Show Me the Blog here in St. Louis is Marcie Hill who writes a blog for Chicago’s South Side called goshorty.net. 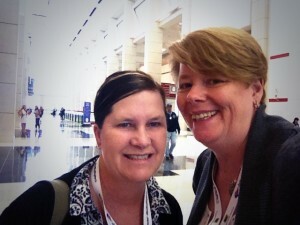 I caught up with Marcie as I was headed into lunch one day. Had a little unexpected time to visit over lunch. Mary Beth Coudal is someone I met through #blogchat and #rockstarchat who I have talked to for a while online and I missed each other a few times but were certain to meet up. When we did she introduced me to Lisa Mar Jones and we were lining up for a photo, Blogher co-founder and CEO Lisa Stone walked by and we were able to snag her to join the picture. Last year’s Show Me the Blog also was how I first connected to fashion bloggers Raijean Stroud of Swa-Rai Blog in Chicago (left) and Kitty Bradshaw of kittybradshaw.com in New York. I ran into the dynamic duo at the expo and spent the afternoon’s break shoe shopping with them at Nordstrom and grabbing a bite with them too. 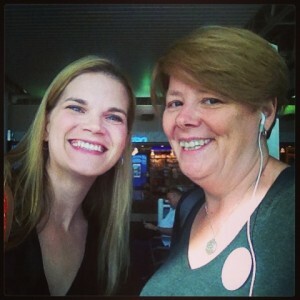 A new friend I found as I was preparing for BlogHer ’13 was Australian ag girl blogger The Farmer’s Wifey! What a great happenstance to run into her in Chicago among the thousands there. I’m pretty sure we were the only ones there talking about Narrabri & Goondiwindi! Those are just some of the faces of my BlogHer ’13 experience and I think you can tell with all the smiles, it was a good time all around! With all those friendly faces, I was in the midst of a great learning environment. I’ll write some of that up soon so you can see some highlights on what I learned. I encourage you to visit all theses blogs! They are great people sharing their voices! « What’s Extravagant Fruit, Like a Fifty Dollar Mango Look Like? Or Maybe a Pair! Hope to go next year! That would be awesome Jan! So much fun! Would love to go next year! It was so nice to meet you in the vlogging session! And thanks again for the restaurant tip–I think my husband and I are going to go have a date night soon. Great meeting you Meryl. Thanks for coming by and do let me know if you go to Harvest…. the food was awesome when I went! 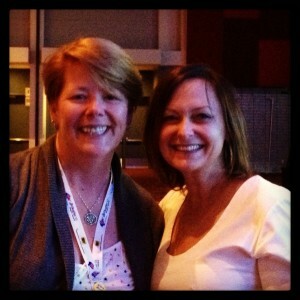 Janice, I so enjoyed meeting you and all the Ag/Farm bloggers. It’s really moving to me, as a Montanan, to meet you and other women putting voices and stories to this part of America. Thank you. Having so many friends in the blogchat, ag and Missouri blogging communities, it felt that everywhere I went, I was seeing friendly faces. It is truly something to be in a crowd with that vibe. I think two weeks vacation in Japan, walking all over the place everyday was good prep for BlogHer…. seemed being on my feet there wasn’t that bad! LOL. And now you join the crowd of the Montana peeps…. I have so many great friends in Montana! They have been giving me a hard time cause I have never visited that beautiful state…. I really need to go out there soon! But they all know I shy away from cold weather too so I’m guessing next summer may be the right time for me!